Grand Old Waikiki in a modern light. Is it possible to move forward while living in the past? To live in a world-famous tropical locale that harkens back to the 1900s, yet at the same time, propels you into the future? The answer is “yes.” This is Allure, where historical blends with contemporary on Waikiki’s far west end. A place with such profound beauty and inexplicable magic, it has drawn thousands to its shores for centuries. First, as an enchanting playground for Hawaiian royalty. Later, as a mecca for board surfing made popular by Duke Kahanamoku. During the roaring ‘20s, Waikiki enticed Hollywood’s wealthy: Clark Gable, Bing Crosby, Shirley Temple, and Groucho Marx, to name just a few. Writers, musicians and artists were also drawn here in hopes of finding inspiration. Waikiki. This was the place. Surf and sunshine. Palm trees and ukulele music. Hula dancers and beach boys. Sunsets and moonrises. The ultimate dream to which so many aspired. Kalakaua Avenue has become the lively main boulevard, with lavish hotels, high-end shops, and eclectic restaurants. A stroll along the promenade will take you wherever you desire. The renaissance of Waikiki has brought about a revitalized and upscale destination that offers it all. Like candy for the eyes, colorful flowers, tranquil waterfalls, and Hawaiian sculptures fill your world. It seems no matter where you look, Waikiki is still that place in the writings of Robert Louis Stevenson and the hearts of millions all over the world. Only more vibrant. 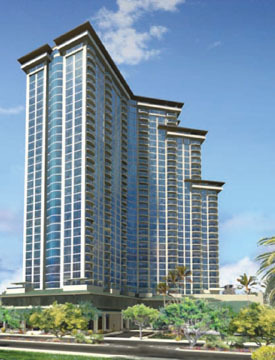 Waikiki spans just two miles, from five hundred acre Kapiolani Park to the Ala Wai Canal. One-half mile wide, it is bordered on the south by famous Waikiki Beach and the Pacific Ocean. Waikiki continues to be one of the world’s most desirable locations. And in the midst of this vibrant and celebrated neighborhood, is Allure Waikiki with the Kalakaua address that distinguishes it from so many others. Calm waters nearby still invite locals and visitors alike, while bringing a natural balance to the buildings that border its azure shores. Waikiki is a place where old and new come together to share this majestic setting. And true to its roots. At the very entrance of Waikiki, Allure Waikiki emerges as one of “the” real estate opportunities of the time in Hawaii – one of the only in Waikiki. A regal, plantation-style “Grand Lanai” draws you in immediately with its columns, reminiscent of homes belonging to Hawaiian royalty in the 1900s. The open-air design naturally lets the indoors out and the outdoors in. 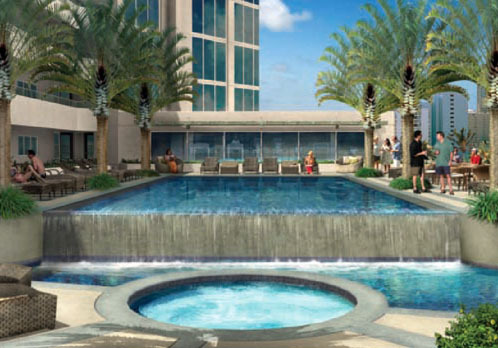 From the moment you set foot inside, you see that this is more than a beautiful new 35-story upscale condominium, it is a tribute to Hawaii’s past, with an urban Pan Pacific twist. Designed by Architects Hawaii, Allure Waikiki was created from a conscious and tireless effort to incorporate true Hawaiian history and culture. You’ll notice it in the architecture, the rich Hawaiian woods, the native plants and flowers, even the Hawaiian fishpond (moehonua) nearby. As if a surreal dream, once again, people gather. Tell stories. Listen to music. Dance. Play. Live. A world of contemporary elegance. There is something about its classic beauty. 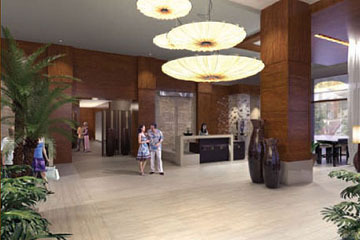 Unassuming, yet stylish, Allure Waikiki manages to maintain a comfortable Hawaiian feel with upscale urban luxury. One-, two, and three bedroom residences range from 833 to 1,633 square feet with exquisite features throughout. Entertain inside your own private retreat. Relax on the lanai. Picnic in the park. Exercise in the fitness center. Your new home will provide you with the ultimate island lifestyle. • Grand Lanai/Lobby — 18’ high ceilings. A sophisticated open-air lobby with modern tropical design and an indoor/outdoor feel. Rich, warm wood finishes complement the contemporary art. 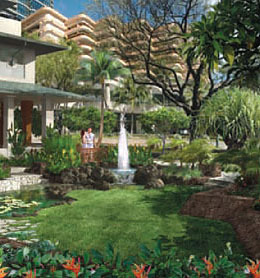 • Approximately 32,000 square feet of lush park and gardens on the ground floor featuring Hawaiian tropical plantings and pond. Yet another place to play. Escape to a private tropical retreat, within the comfort of your own residence. Allure Waikiki features a magnificently landscaped recreation terrace on the 6th floor, where you can enjoy the warm Hawaiian sun, and be cooled by tropical breezes. Exercise in the state-of-the-art fitness center overlooking the pool, take a dip in the infinity-edge pool, soak in the outdoor spa, or just find sanctuary on a lounge chair and read a good book. The terrace is the perfect place for entertaining family, friends and colleagues with an afternoon barbeque or evening cocktails. And as the Waikiki sky begins to turn a rainbow of colors, you’ll remember why you live in paradise.